STAYIN' ALIVE: Notice how Clemson isn't listed as a "First Four Out" or "Next Four Out" team? Well, that's because, contrary to what some experts might tell you, a team that went 6-12 in the ACC is not going to nab an at-large bid. Clemson has to win the ACC's auto-bid. In doing so, it will have to build on its win over NC State as Duke is up next. 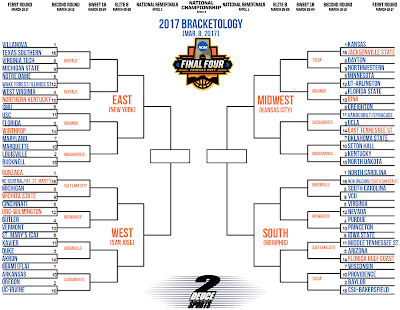 The road to an automatic bid would look like: Duke-Louisville-North Carolina-Florida State. Clemson would have earned a spot in the NCAA Tournament by winning five games in five days against that group. ILLINOIS STATE: Continue to watch the Redbirds in many brackets. A good point was made on Twitter: While Illinois State has a decent resume, many lesser mid-major resumes have been NIT bound in recent years. In a year like this, when so many major conference teams have the ability to notch key upset wins in conference tournaments, Illinois State will have to sit back and watch, clinging to a spot. If the Redbirds get in, it'll likely be in a First Four game. If not, it'll be clear the committee favored the "Top 50 RPI wins" stat which, unfortunately, is built to kill mid-majors.